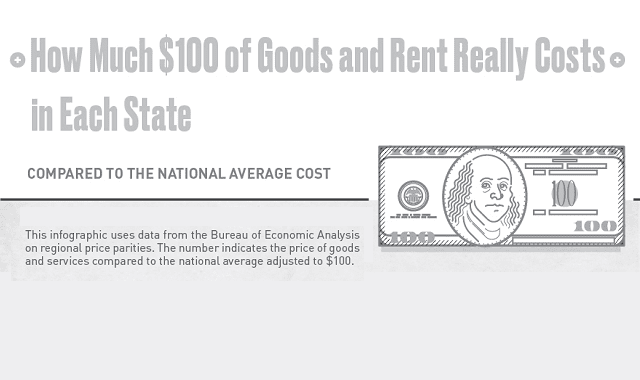 How Much $100 of Goods and Rent Really Costs in Each State #Infographic ~ Visualistan '+g+"
When is $100 not really $100? Depending on where you live in the USA, the costs of good and services, as well as rent, can vary widely. When compared to the national average (and normalized to a $100 value), states like Hawaii, New York and California see some of the most expensive costs of living in the USA, whereas Mississippi, Alabama and Arkansas experience the lowest costs of living. The difference between the two are staggering. When it comes to relocating, the cost of living is a major factor people should consider before moving to a new state. Keeping a tight budget is all about stretching your dollar as far as possible. This graphic from the people at TitleMax.com breaks down the cost of living for every state and compares it against the national average. There is also a separate breakout for rent. Using this data can help a person decide if they’re getting the most value for their money, and may help them decide if moving is a worthwhile decision.